If you're anything like me you are always looking for new ways to train and for new things to learn in karate. Over the many years in my training I have learned many things. There always seems to be something new to learn. Gichin Funakoshi the founder of the Shotokan Karate Style wrote a poem that illustrates what I feel about learning something new. It is included here and taken from his book Karate Do Kyohan. Although we can interpret the poem in a couple of ways, it is the learning new things that I will address; the subject of Kakie, which is an old subject indeed. In learning the old I can truly understand the new because of the foundation that is laid by the old. Principles of body motion do not change. Laws of gravity do not change on the earth. How the body acts under times of relaxation, stress, anxiety, and rest are all different. Therefore the study of the reaction of the body in these different states is an important factor to consider in martial arts training. Further, the reaction from these states in conjunction with other human beings and animals that are interacting with us must be considered as well; especially if we are physically threatened in any way. The intentions that other individuals have towards us can be determined in many different ways. Their manner of speech and body language, if studied closely, can usually give us clear indications as to whether or not they mean us any physical harm. There are those occasions however, when we, due to our not being aware, do not spot the harm intended to us. How can we train for such situations? When any individual attempts to do us physical harm we may react in many different ways. As an example, think of what you would do if all of a sudden you looked up and saw a rubber ball heading right at your face. Your natural reaction would be to raise your hands to prevent the ball from hitting you in the face. You know that getting hit in the head hurts more than getting hit in the hands. Your brain has learned this through your years of growth and your body "naturally" reacts to something being thrown at your head by raising your hands in front of it. This is a Natural Reaction. Another type of reaction that flows from Natural Reaction is Forced Reaction. This occurs when you are required to act in a way that you are not physically accustomed to. For instance, you are grabbed by the arm and held tightly. You did not see this coming and your body could not naturally jerk away from the grab. Now you are caught and are forced to react in some way in order to get out of the grab. You have been threatened and are aware of physical danger. So you are forced to perform some physical act to escape from the opponent's grab that does not come naturally to you. This is a Forced Reaction that happens when your Natural Reaction does not work. You might try to pull away from the grab but find that it is difficult. This is not a natural reaction because you have to consciously think about doing it. Your opponent has successfully put you in a Forced Reaction position. One in which you must think of "how" to escape from the grab. You must process information in your brain before you can physically react. It is this grabbing, or holding type of physical contact that will be discussed in Kakie training. We will also address this "processing" of information in our brain before we can physically react. The reactions that we are forced into by an opponent who intends us physical harm must be of such that they will effectively bring us to safety; either by a clean escape or by leaving our opponent unwilling to continue their assault. In addressing the grabbing or holding issues above, we will look at one aspect of training that is preferred in the Okinawan Karate styles. 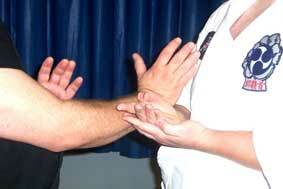 This training exercise of sensitivity is known as "Kakie" or "Push Hands" in the Okinawan Dialect. It is a method of body sensitivity training by touching your opponent to learn where they are weak or strong and to learn their intentions through physical contact. This Okinawan exercise was derived from the Chinese exercises of "Koki" or "Chi Sao" which also means to "push hands". Kakie is the constant physical contact of partners arms in resistant motion either in up/down or circular rotation. In other words, while one partner pushes the other partner will resist and then try to counter by pushing back. Through this pushing and "sticking", you can learn to "feel" the intentions of your opponent. This type of training is essential in learning how to physically defend yourself. 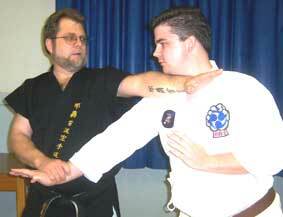 There have been many theories about physical self-defense over the decades and even centuries. We will limit ourselves to the discussion of being in a situation of being held or grabbed with the additional intent of our opponent to strike us in some way. In this way we can focus our intention on the degree of aggressiveness that a fight has progressed to. When we are grabbed we are forced to respond at a very close range to our opponent. Gone are our chances to now flee and defuse the aggression by means of verbal communication or fleeing the scene. We are captured. Now we must get away to create distance between ourselves and our opponents in order to be safe. To do this will require us to use some physical force in order to gain control of the situation and send a message to our opponent that they do not want to continue their assault on us. Training with Kakie will give us the advantage in this situation. If you were to hug someone you could immediately feel their intentions. A hug can be warm, gentle, aggressive, passionate, condescending, heartfelt, hard, soft, unsure, nervous, and include many other feelings not already mentioned. Additionally, you can react to the physical motions from the person giving the hug. How? You can reciprocate your feelings by surrendering yourself and acknowledging the hug in the same way. Or you can send your own physical message of intentions through your hug. No matter which way you choose, there is no doubt in your mind and body, that you can both feel the intentions of the person giving you the hug and decide what feelings that you want to send back. By realizing that we can process this information through "feeling" the messages sent to us through physical contact, we can begin to understand Kakie training. We learn to process information quicker then described above. Touch is powerful. We have millions of nerve endings in our skin. We sense others intentions through touching. 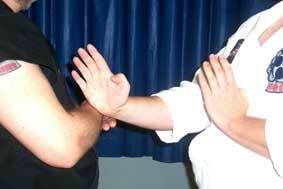 Therefore, we can learn effective self-defense through Kakie training. To learn Kakie we will examine the exercise in three different steps. They are recognizing the opponent's intentions, acting on the opponent's intentions, and maintaining an upper hand with our counter. Before we discuss each of the three steps individually we will first learn one of the most common ways in which Kakie is performed. To begin Kakie training first face your partner and bow. Then each of you assumes a right foot forward Sanchin stance. The left foot forward Sanchin stance is perfectly acceptable also. For simplicity in my description though we will use the right foot. After assuming you right forward Sanchin stance each partner then presses their right forearms together near the wrists. The left hand is placed palm open, fingers pointing upwards next to and guarding the solar plexus. From this position one partner begins the exercise by pushing his right forearm towards his opponent and rotating his right palm so that it faces his partner. He thus pushes his partner's arm back towards him. While doing this the opponent resists slightly the pushing motion of his partner. As he does so he turns his left hand flat palm open and facing up to catch his own right palm in. The opponent then continues the exercise by pushing back towards the attacking partner's forearm in the same way with the attacker resisting the opponent. In this manner the exercise is continued both back and forth training each other's forearms through resistance of the pushing hands. This motion is similar to an up/down scenario. Your shoulders and arms will get extremely tired and sore before long. Simply switch you stance to left foot Sanchin and continue by training your left arm. This training of pushing and resisting back and forth is one great way to build up your shoulder and arm strength. It is a good idea to first do this consistently over a period of time in order to be able to last any time at all with the techniques that will be studied in this article. Further, both partners should start out with light resistance to the pushing hand and gradually build up the resistance over a period of time for maximum benefit. It's just like weight training with the amount of weights and repetitions that you use. It must be gradually built up. Once you have built up your training to a pretty good level of pushing and resistance, then you are ready to train with techniques and explore the three different steps of Kakie training. The first step is recognizing the opponent's intentions. In order to do this I like to blindfold my students as they are doing the exercise. Taking away the eyesight makes you concentrate with your other senses more. In this case we will be developing our sense of touch. Start the Kakie exercise with blindfolds as described above. The object of each partner is to stay connected to the other by not permitting each other to pull away. By doing this we are trying to keep our arms heavy and "sticking" against each other. The Okinawan term for this is Muchimi which means heavy and sticky. No grabbing or pulling is allowed. Simply by feeling each others arm we are to utilize our sense of touch to stay up against our partner. By moving at different speeds and by utilizing different strength levels in resistance and pushing we can train each other to become sensitive to our partner's physical intentions. The slightest movement of our partner triggers a response from us. In this case we are training to not let our partner get away and do something to us. Staying stuck to them keeps us in touch to what is going on and further protects us by limiting their options. When one or the other partner moves their arm away from the other then this exercise is over and must begin again. You can simplify this exercise/drill so that just one partner is trying to separate their arm from the other and then reverse after awhile or when one loses. Keep the blindfolds on. The results of this exercise are increased touch awareness and a better way to gauge physical intentions when fighting at close range. This of course is where most fights are fought. One is always trying to control the other. The next step is acting on the opponent's intentions. Now that you have practiced the above step it is important to not just feel the opponent's intentions but to be able to react to them in a particular way. There are several ways to practice this. First you can react to your partner's pushing towards you by simply totally relaxing your resistance thus unbalancing him for just and instant. You can also redirect your partner as he is pushing towards you hard thus unbalancing him and creating an opening for a counter. You can also be the aggressor when your partner tries to release from you by shuttling forward in your stance thus staying "stuck" to them and keeping them in check from doing a technique on you. In each case you are learning to act or react on your opponent's intentions that you felt through Kakie training. After doing this with each person taking a turn at being the aggressor, you can then both try it simultaneously. 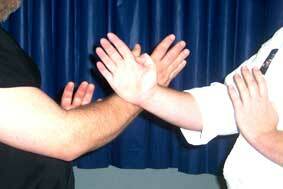 After all, this is what simulates a real confrontation and is of the utmost importance in self-defense training. The most advanced form is to agree to do this simultaneously with blindfolds on. No striking is allowed in this and the above mentioned exercise/drill. The third step is to maintain the upper hand with our counter. Here is the final reason for Kakie training. It is to win the confrontation decisively leaving our opponent in a state that they do not wish to continue the fight. This can be done utilizing many of the techniques from your kata. This is not limited to just strikes, but may include a combination of joint locks, strikes, takedowns, and even kicks. The only objective is to defeat your opponent. To practice this we take our second step and add pre-arranged counters to it. We then practice them one at a time to develop an arsenal of responses to the different intentions that we feel our partner's doing. It is most important to be very repetitive doing each response that you come up with thousands and thousands of times. In this way they become ingrained in our subconscious and become reactionary for us; much like preventing a ball from hitting us in the face. Run through several "what if" scenarios with Kakie and select the ones that best fit your needs. Do not choose a large number though. This will only clutter your brain and make you indecisive in your reactions. It is best to have a few well practiced and effective techniques. Each partner must take turns and constantly work on Kakie training to learn physical sensitivity intentions. For this part of training do not use blindfolds. In summation we can see how an "old" exercise from the past can be used in our "new" type of training. Rediscovering techniques and training methods from the past and then adding our own techniques to them make them new. Of course not all that we add to them make them better. We must be discriminate here and learn to throw out and discard that which does not work and is absurd. Just by doing the first step described above will enhance your physical endurance and strength. There are many other benefits and ways of doing Kakie. In this article I have only discussed the back and forth version. Others include moving from the stationary stance in a circular motion, back and forth, and changing directions. Also Kakie may be done by moving the hands in a circular motion, up and down motions, and even with two hands at a time. The benefits and techniques can be endless. You will see many of them in a short period of time. By constant training we can change "forced reactions" into effective "natural reactions". Like anything else though, you will lose if you snooze. So get busy and train hard and train long!